A key part of being a successful squash coach is professional development: staying up to date by taking courses and workshops that are based on the most current information. sport scientists, practitioners, and administrators who need more squash-specific knowledge. All courses are facilitated by Tim Bacon, M.A. 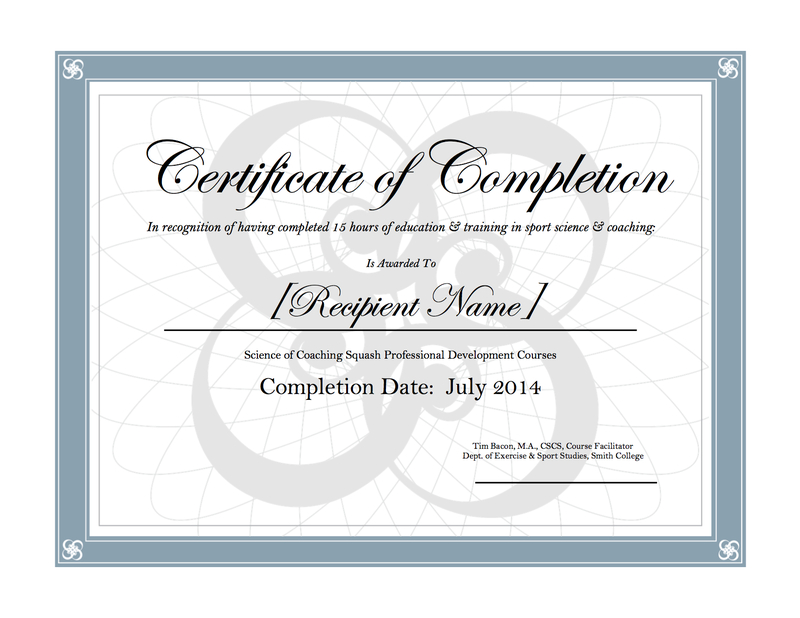 who has been designing and delivering coaching education courses since 1987. Highlights of Tim’s coaching education related experiences can be found at this link. Upon completion of all courses, participants will receive a “Certificate of Completion” that attests to the numbr of hours of coursework completed. For successful completion of the ASEP Coaching Principles Course test – ASEP Certification*. Those obtaining 90% on the ASEP test may apply to be ASEP Instructors and deliver their own Coaching Principles courses. Although some courses may have a “Special Focus”, learning materials, classroom discussions, and on-court teaching is applicable to all coaching contexts. As all of the courses involve a significant practical on-court component, enrollment is limited to 15-20 coaches (five courts: 3-4 per court – ideal number for “micro-teaching” – one coach to three students). 2. Register by phoning Tim at 1-413-330-8222.
check – make payable to “Tim Bacon” – mail to above address. Cancellation Policy: Full refund if cancellation is received 14 days prior to event. All areas of team coaching and sport science related to squash with a special emphasis on adapting coaching to the younger 8 to 18 developmental squash athlete and the U.S. High School squash season. Also great for NEW squash coaches. As above but with an emphasis on coaching the physically mature (18+) more advanced squash athlete and the U.S. College Squash Season. Coaches will learn how to use the iPhone/iPad app to break down and analyze any squash stroke into five phases, and give appropriate feedback to athletes using the SEVEN BIOMECHANICAL PRINCIPLES (Coaching Association of Canada Level 2 & 3 Theory) and Ubersense drawing, slow motion playback, and recording tools (emailing the athlete a video file of coach feedback). Coaches will learn how to analyze squash match video using the Dartfish EasyTag app for iPhone/iPad and Android. Coaches will also learn how to develop a “tactical model” to guide analysis and then the related “tagging panel” – basically deciding which shots to note and analyze. *Note that for these video analysis workshops coaches are free to use other apps or even old-style camcorders using the course, but support will be given only for the listed apps (questions on other apps can be posed during breaks). Exos (formerly Athletes Performance) are the U.S. Company which trained the German National Soccer Team to the last four World Cups (and the U.S. Women’s National Soccer Team). 110 of the top 2oo 2014 NFL Draft picks were trained by Exos. What makes Exos unique is that the programs have been designed by strength coaches and rehabilitation professionals resulting in an effective and injury-free way of training. Tim Bacon has been using this system exclusively to train athletes since 2008. Coaches will learn the EXOS five-part system, and in addition the basics of squash physiology, energy systems training, and periodization (this part based on the newly published 2013 materials from the Coaching Association of Canada). 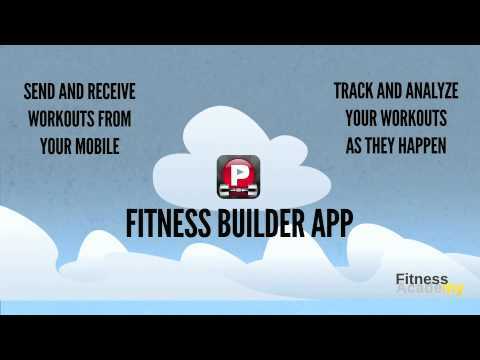 The will also learn how to use the PumpOne Fitness Builder app to quickly design and deliver (programs with detailed exercise descriptions and video) to their athletes. Coaches will learn how to set up a season-long mental training program based on five, short one-hour meetings with their athletes: 1) Analyzing Best & Worst Performances; 2) Goal-Setting; 3) Developing a Focus or Match Plan; 4) Developing a Refocus or Distraction Control Plan; 5) Evaluating Plans and adjusting goals. At the end of this workshop (all necessary forms provided), coaches should be able to help their athletes perform better mentally without the assistance of a sport psychologist. This course is essentially the Coaching Association of Canada Level 4 Psychology Course (which Tim Bacon has delivered several times in both the generic and squash-specific versions). All forms provided. *Note that it is not necessary to take the above course prior to taking the course below. This course is designed for coaches who wish to go beyond the basics learned in the above course and a) learn how their athletes are motivated and possible ways to influence their motivation; b) how to interview and help athletes diagnose more complex sport mental issues; and c) how to help their athletes use the five mental skills (relaxation, positive self-talk, activation, visualization and concentration) to improve their practice and match squash performance over a season. All forms provided. This course is essentially the Coaching Association of Canada Level 3 Theory Sport Psychology Module, supplemented with the most recent applied research in motivation. Coaches will learn the simplest and most practical leadership models (Tuckman’s Team Development and Situational Leadership) and use them to analyze their own team dynamics so that they will be ready to adjust their leadership style and behavior when required. More than one million business leaders have been trained in Situational Leadership, and in this workshop the model is adapted to our squash context. Tim has been teaching Situational Leadership to sport coaches since 1992. 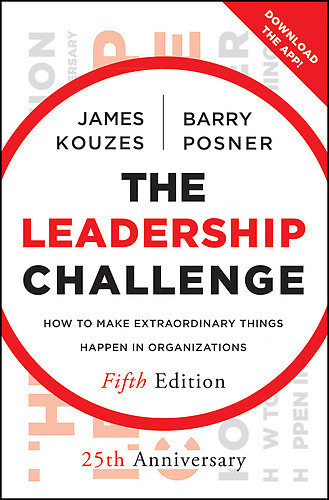 Coaches will have the opportunity to analyze their own leadership behavior using the world’s number one leadership “system” (3 million trained): The Leadership Challenge. In addition they will also assess their own basic communication “style” and learn how to adapt it to facilitate better communication with their athletes, fellow coaches and administrators. Tim designed and teaches ESS 520 Leadership for Sport Coaches in the graduate program at Smith College. Recent research has shown that for an open (tactical with many decisions) sport like squash a “Tactics First” approach produces smarter and more mentally tough athletes. Coaches will learn how to use a tactical model (in this course the Zone model) to develop, deliver and evaluate Tactics First training to their squash athletes. This course targets coaches working with developmental athletes (8-18) and coaches of players to a 5.0 skill level (U.S. rating system), and will include how to use Dartfish Easytag to help analyze tactics. In this course coaches will learn how to apply a second zone tactical model (Kevin Parker/Yvon Provencal’s “Egg” Model) to designing practices and evaluating mach play, and then be guided in how to develop their own tactical model of squash. More advanced tactics and shots will be addressed, and will include how to use Dartfish Easytag to help analyze tactics. This workshop is essentially the Coaching Association of Canada’s Level 4 Performance Analysis task. This workshop is a shorter version of the Video Analysis workshops held on the September 13-14 weekend. There will be less focus on the “why”, and more focus on the “how to” of setting up and using the Ubersense (technical analysis) and Dartfish EasyTag (tactical analysis) apps. This is a shorter version of the Physical Training course presented on the September 20-12 weekend. There will be less emphasis on design and on-court energy systems training and a greater emphasis on using the Exos system for off-court training. Coaches will learn how to use the Exos online interface and the PumpOne Fitness Builder app to put together programs for their squash athletes. Tim Bacon can work with squash coaches to design education activities specific to their needs, or the needs of a group of coaches at a College, Club or Organization. Hourly rate is approximately $75-100 depending on the task requirements. Outside of the October 1 – March 1 U.S. College Squash Season, Tim is available to consult with athletes and teams in the Physical and Mental Training area (in person or via video conferencing such as Skype or Facetime) and can also perform Technical or Tactical Video analysis if squash coaches make video available (e.g., Dropbox or Email). Hourly rate is approximately $75-100 depending on the task requirements. Physical: Using the Pumpone Fitness Builder interface, Tim can help squash coaches design weekly, monthly or season strength training plans for their team. These workouts can be sent to athletes and viewed on a variety of devices: exercise instructions and video. Psychological: Using a “mental training manual” template, Tim can help College Squash Coaches ‘co-author” a 30-40 page manual for their team – “branded” with the College logo, athlete pictures, and coach input/writing for each chapter. Each chapter will feature a mental skill, technique or procedure with instructions, a section for athlete self-analysis and a training log. For each Chapter of the manual the coach gets an opportunity to express their views and tell stories about “confidence”, “concentration”, etc. The publication of this Team Manual might be useful documentation for those squash coaches seeking promotion or tenure. Team manuals may also be sold within the college and local squash community (not outside) as a source of fundraising revenue. Contact Tim for more details and an example manual will be provided shortly. *ASEP Certification – visit the ASEP website for exact requirements for Certification.